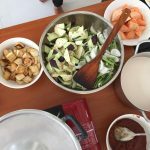 [post_content] => Every meal prepared by our beloved staff members Maly and Congkea is cooked with love, laughter, spice, and vegetarian options, of course. We’ve been living at the Center for over two months now, and are constantly surprised with flavor profiles and sauce combinations that I literally dream about regularly. 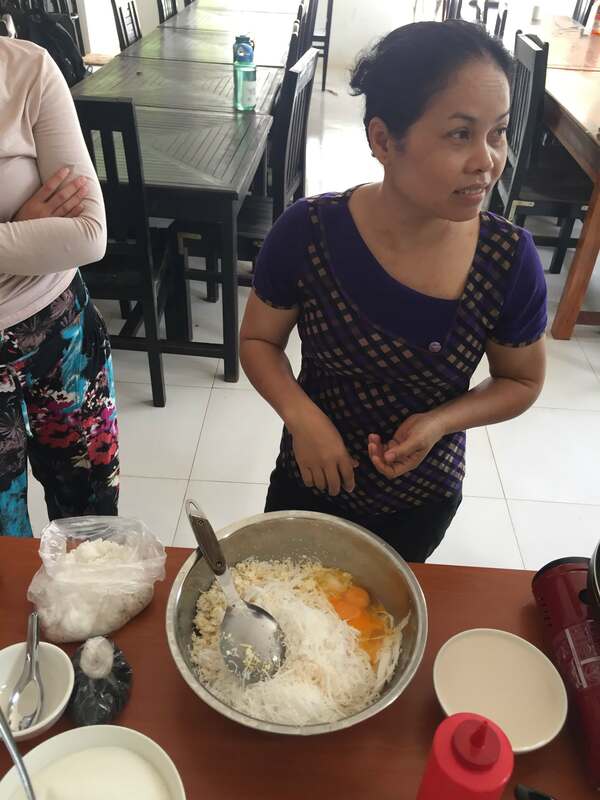 This weekend, after returning from our trip to Southern Cambodia and Vietnam, we were lucky enough to learn a few cooking tricks from the masters themselves, and prepared two of our favorite dishes together. 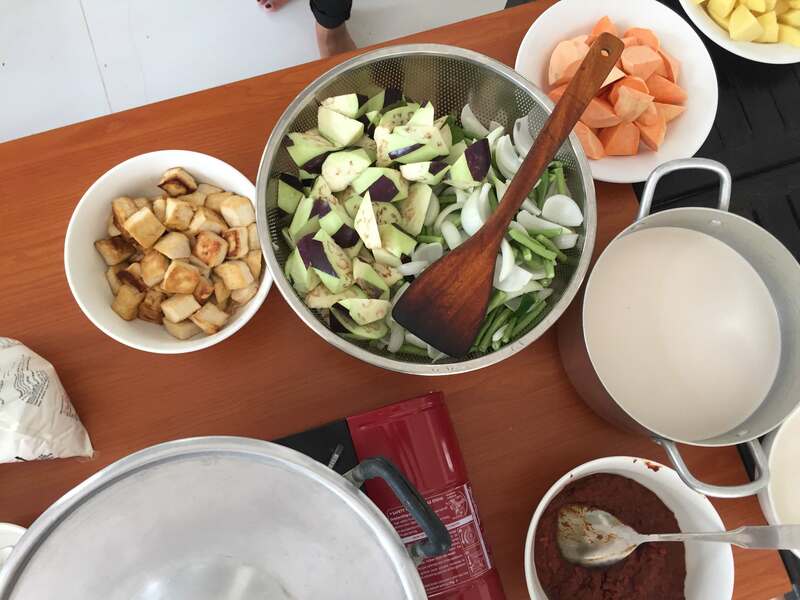 Among our favorite meals is traditional red Amok curry, made with tofu for our environmentally conscious eaters. The curry is an explosive blend of lemongrass, chili, and coconut flavors and filled with green beans, onions, eggplant, tofu, and potatoes (which we now affectionately refer to as dawmlong barang). The curry is served with rice and any added spice that your mouth can handle. Maly, our wonderful head chef, prepares the curry sauce that defines this dish from scratch, and was sweet enough to share her secret recipe with us. Another Center favorite is a unique kind of coconut-corn-sesame pancake. It’s difficult to describe the pancakes unless you’ve had them—their consistency is similar to firm sticky rice, but with crispier edges and shreds of fresh coconut throughout. The recipe combines the sweetness of condensed milk and fresh coconut in a miraculous harmony of flavors served on a banana leaf. We rarely have leftovers. 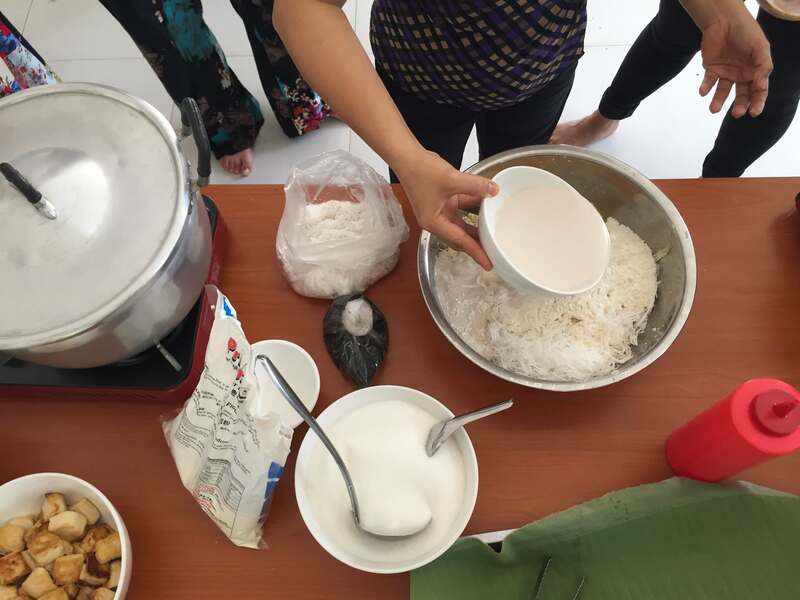 We’re all looking forward to recreating these special chnganh foods to share with our friends at home, and can’t wait to see what Maly and Congkea cook up next! Now try them for yourself! Slice lemongrass and turmeric root. Remove middle section of Kaffir lime leaves. Remove skin from garlic and red garlic. Re-hydrate chilies and remove all seeds. Combine all ingredients with curry powder in a blender and blend until the mixture turns to a paste. 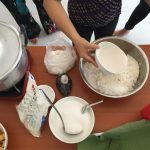 Combine 250ml of coconut milk, paste from the blender, sugar, salt, chicken powder, and fish sauce into a large cooking pot and heat on medium-high heat, stirring frequently, for 15 min or until the mixture becomes very red. Cut chicken into small pieces, add to pot, and continue cooking for around 10 min or until chicken is fully cooked. Add the rest of the coconut milk, potatoes, and sweet potatoes and cook for another 10 min, until potatoes are fully cooked. Add eggplant, long beans, and onion and cook for 5 min. Serve hot over rice. Cut the corn off the cob and mix all ingredients in a large bowl. Form into pancake shapes and fry in a pan with a bit of oil on medium-high heat. Cook until browned on both sides. Serve on a banana leaf. [description] => The Lower Mekong Basin, extending over most of Cambodia and incorporating the great Tonle Sap Lake, hosts diverse ecosystems, including lowland evergreen forests, dry dipterocarp forests, seasonally flooded gallery forests, and estuarine mangroves which give rise to the Indo-Burma global biodiversity hotspot. Students examine the dynamics and ethical challenges surrounding environmental change and development in the Lower Mekong Basin. They also learn about the complexity of Cambodia's struggle to balance biodiversity, development, and human needs. [post_content] => In Cambodia, remnants of 12th-century temples share the countryside with wild forests and agricultural villages. Diverse ecosystems from the Bokor Mountains to the mighty Mekong River harbor rare species such as the Asian elephant, sun bear, and endangered Irrawaddy dolphin. The Tonle Sap Lake swells to eight times its size each year, creating a dynamic seasonal shift for the communities of fishers and farmers who call this region home. Cambodia is extremely vulnerable to climate change. This, along with rapid development, has led to decreased food security, a loss of traditional knowledge, and the destruction of critical habitats. Organized community efforts and ethical governance are needed to reverse these trends. SFS research in Cambodia seeks to inform a viable future that balances human needs and biodiversity conservation. [post_excerpt] => Learn about the complexity of Cambodia’s struggle to balance biodiversity conservation and development; explore a variety of regional development and conservation challenges and community-based solutions during travel across rural and urban Cambodia and Vietnam. Every meal prepared by our beloved staff members Maly and Congkea is cooked with love, laughter, spice, and vegetarian options, of course. We’ve been living at the Center for over two months now, and are constantly surprised with flavor profiles and sauce combinations that I literally dream about regularly. 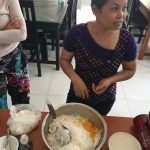 This weekend, after returning from our trip to Southern Cambodia and Vietnam, we were lucky enough to learn a few cooking tricks from the masters themselves, and prepared two of our favorite dishes together.